DePuy Orthopaedics recalled its ASR Hip Resurfacing System and ASR XL Acetabular System in 2010 after studies showed that the hip implants had high failure rates. The devices were recalled from the Australia market in 2009, and several experts have criticized how DePuy delayed the international recall. DePuy Orthopaedics recalled its Articular Surface Replacement systems from the worldwide market in August 2010 after receiving data that indicated the devices were failing at an unexpectedly high rate. Implants from the company’s ASR XL Acetabular System and ASR Hip Resurfacing System were implanted in more than 93,000 people worldwide and 30,000 people in the United States. 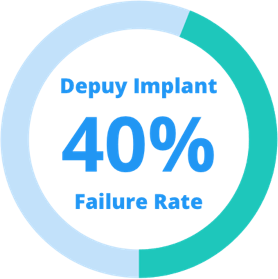 In a statement, DePuy cited statistics from the National Joint Registry of England and Wales that showed 13 percent of patients who received the XL Acetabular implants needed revision surgery within five years. About 12 percent of those receiving the Hip Resurfacing implants required revision surgery within five years. The expected lifespan for most hip implants is 15 years. The company claimed that other sources indicated that the ASR hip implants had lower revision rates, but media investigations and lawsuits claim that DePuy knew of high failure rates more than a year before the devices were recalled. DePuy stated that it would “cover reasonable and customary costs of monitoring and treatment for services, including revision surgeries, associated with the recall of ASR,” in a 2010 statement, but media reports indicate that the company denied some claims for medical costs. All-metal DePuy hip replacements, including the ASR models, have been linked to dangerous complications. When the metal components rub against one another, they release metal fragments that can cause metallosis and other side effects. The Hip Resurfacing System did not affect patients in the United States because the U.S. Food and Drug Administration declined to approve the product in 2009. The XL Acetabular System had been used in the country since 2003. Some experts believe that the ASR implants should have been recalled prior to 2010. More than two years before DePuy pulled the metal hip implants from the market, patients complained of complications leading to revision surgeries. Australian health officials recalled the ASR products from their market in 2009 after data showed that the implant had an abnormally high failure rate. In March 2010, DePuy sent a letter to doctors advising them of the high failure rates. The company also informed them that women and people with weak bones were at the highest risk of implant failure. According to legal documents, DePuy knew its hip implants were defective before the recall. Failure rates in some of the company’s studies were close to 40 percent, and company executives discussed the failure rates before deciding to discontinue the devices in 2009, according to The New York Times. The company continued to sell its remaining devices before issuing the recall. DePuy hired a third party company, Broadspire Services, to handle patient claims for out-of-pocket medical expenses related to the ASR recall, according to a Reuters report. Instead of deferring to the recommendation of a patient’s doctor, Broadspire experts could deny claims if they didn’t think revision surgeries were necessary. “Doctors who are evaluating these cases are being paid indirectly by DePuy, and research suggests that even when we are very well-intentioned we can be influenced by conflicts of interest,” Kristin Smith-Crowe, who specializes in business ethics at the University of Utah, told Reuters. DePuy also reached out to doctors to help them identify patients who may require revision surgery by sending informational packages that contained details about the recall and the claims process. The company urged patients to contact DePuy to make the claims process more efficient. It also established a website with details about the recall. Critics say the company was trying to collect patient data for use in potential lawsuits. Lawyers also say DePuy was trying to settle legal claims before potential claimants contacted an attorney. DePuy continued to sell other metal-on-metal hip implants after the ASR recall, but the company no longer sells metal-on-metal components.